An OSPF area is a logical grouping of routers and links by a network administrator. 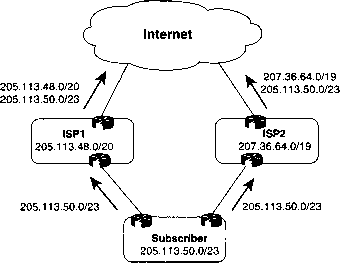 OSPF routers in any area share the same topological view (also known as the OSPF or database) of the network. OSPF is configured in multiple areas to reduce routing table sizes, which in return, reduces the topological database and CPU/memory requirements on a router. Routing tables become very large even with just 50 routers. Cisco recommends no more than 50 routers per area. The OSPF database is exchanged in full every 30 minutes, and if this database is too large, every time this occurs, the amount of bandwidth used over the network increases and can cause severe delays in sending user-based traffic because convergence times are increased. Areas allow OSPF designers to limit and confine changes. Additionally, a number of predefined areas types help reduce the demand on routers, as displayed in Table 2-12. This area does not accept LSA types 4 and 5, which are summary links and external link advertisements, respectively. The only way to achieve a route to unknown destinations is a default route injected by the ABR. This area blocks LSA types 3, 4, and 5. Only a single type 3 LSA advertising the default route is allowed. This solution is Cisco proprietary and is used to further reduce a topological database. This area is used primarily for connections to an ISP. This area is designed to allow type 7 LSAs only. All advertised routes can be flooded through the NSSA but are blocked by the ABR. Basically, a type 7 LSA (if the P bit is set to one) is converted to a type 5 LSA and flooded through the rest of the network. If the P bit is set to 0, no translation will take place. Type 4 or 5 LSAs are not permitted. This advertisement will not be propagated to the rest of the network. NSSAs typically provide a default route. Table 2-13 defines the challenges across various media types, such as Frame Relay and broadcast media. Used typically for Frame Relay interfaces. This is the default mode for subinterfaces. Used in Ethernet and broadcast environments where the election of DR/BDR takes place. To define the DR, use the IOS command ip ospf priority priority-number. The priority-number is 1 to 255. The highest priority will be to elect the DR.
Ethernet is an example of where OSPF will elect a DR to minimize the OSPF updates over a broadcast medium. Each multiaccess OSPF network that has at least two attached routers has a designated router elected by the OSPF Hello protocol. The DR enables a reduction in the number of adjacencies required on a multiaccess network, which reduces the amount of routing protocol traffic and the size of the topological database, especially when more than two routers are deployed on this network segment.